There’s just something about bureaucrats having to actually live in the same backyards they love to regulate that has a nice ring to it. Not like the EPA office in Denver, where employees think it’s okay to poop in hallways because they’re obsessed with over-enforcement of the Clean Water Act or something. We’re talking about moving the Bureau of Land Management, known as the BLM before BLM was cool, to Colorado. Also known as the great outdoors. That’s the idea being pitched by U.S. Sen. Cory Gardner back in Washington — that an agency that regulates the West, should actually relocate to the West. Washington of course will hate it, because Washington is all about keeping government in Washington where it’s harder for us average American folks to get access, especially for westerners. The thrust of Gardner’s pitch is that the more than 99 percent of the nearly 250 million acres of land the BLM manages is west of the Mississippi River. Mayor Hancock and Gov. Hickenlooper are already on board with the idea, presumably because they will want the agency moved to Denver. But Gardner is having none of that. 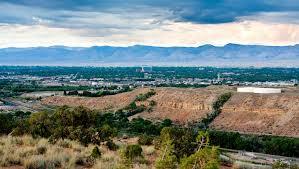 It belongs on the Western Slope, in Grand Junction, he says. And we absolutely agree. After all, Denver is the front yard.